The morning of the University of Delaware Hillel’s leadership retreat started with a lot of instant messaging. A group chat that twenty-one Hillel leaders are currently a part of was blowing up: who’s wearing what, what shoes are we bringing, where’s the carpool information? Our phones are our communication lines, our GPS, our music for the journey from Newark to Wilmington. And they quickly became a much smaller part of our weekend. One of the first things we discussed on the retreat was the idea of “unplugging.” If we were to turn off our phones for Shabbat, to avoid social media or the constant need to check text messages, would we be anxiously awaiting Saturday night or dreading the moment we had to turn our phones back on? 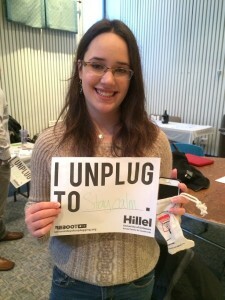 Partnering with Reboot’s National Day of Unplugging, Hillel decided to find out. We were provided canvas pouches for our phones—their ‘sleeping bags’—and the student leaders put down their hand-held tech. As students wrote to Reboot, “I unplug to stay calm, enhance my mind, kesher [Hebrew for ‘connection’].” We put away our phones with the weekend goal of engaging with one another on a deeper personal level without the distraction or pressure of constant outside communication. The big question is, did it work? Were we, as students, as leaders, and as Jewish community members, able to connect more with those around us when we disconnected from our devices? The short answer: yes. As we went about the weekend, discussing ways to improve Hillel, to get more involved on campus, and to form closer bonds between ourselves, we were not interrupted with ringing phones, texted conversations, or the many strange faces of SnapChat. We could engage with our peers in a way that is rarely achieved with the distraction of cell phones. Our conversations shifted from frivolous to in-depth and were held face to face instead of pixel to pixel. But I won’t lie and say that our cells stayed off all weekend. As soon as there was a Kodak moment, iPhones came out. As one student put it, there’s a difference between being plugged in and making memories. Then, as soon as we left the JCC where the main events of the retreat were taking place, students turned on their phones. It wasn’t necessarily a bad thing; it was just different. We were back to ‘normal’ but we were closer than we had been before we turned off our cells in the first place. We had truly gotten to know one other, to connect without wires or even wireless. In the end, the leadership retreat was a huge success, and all of the participants left feeling stronger than we did when we entered. Sure, we were exhausted, trying not to think about the homework we still had to do or the exams we had to face on Monday, but we had come up with solutions to major problems and grown closer as an organization and as individuals. We have new goals and lots of work ahead, but we know we are ready to face whatever comes our way, with or without the help of our phones.